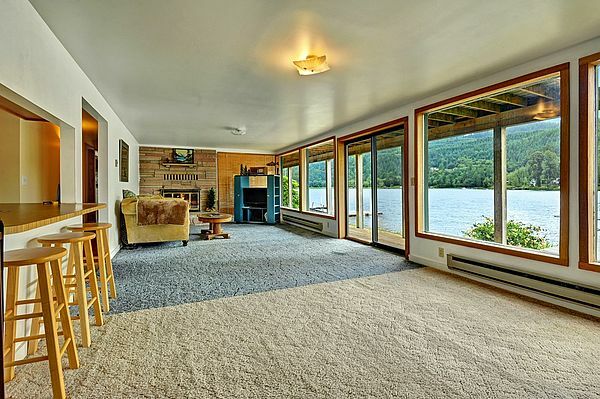 80 feet of Low Bank waterfront on the coveted West side of Big Lake with private dock! Main floor features sweeping wall of windows, spacious kitchen, 5 BR's, 30' X 25' living room, large dining room that opens to to expansive deck, wood burning fireplace and full bath. Lower level features second kitchen, family room with fireplace, bedroom, laundry, & full bath. Additional 40' X 45' foot unfinished basement with access to the lake to store all your gear. Great dock and boat lift round out this gem of a property.